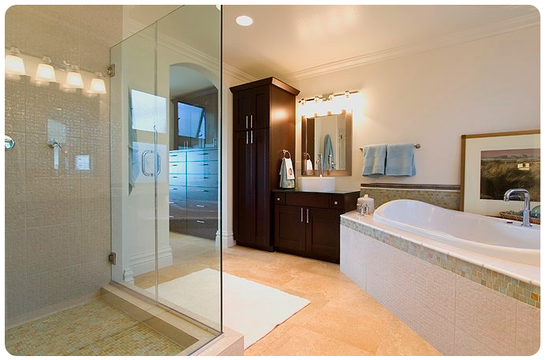 From shower remodeling to custom bathrooms, room additions and more, we are here to help. Call locally or click below. BKR Pros is a leading residential, industrial and commercial remodeling company with affiliates in Birmingham and the Tuscaloosa, AL area. We have more than 20 years experience in all phases of remodeling and specialize in custom shower and bathroom renovations. Bathrooms and showers, especially in the muggy Tuscaloosa climate, can generate large amounts of humidity. When performing a remodel, it's important to take ventilation into account. Without a designated means of escape, moisture will build up and penetrate walls, ceilings, floors and countertops. Mildew thrives, wall coverings and paint begin to peel, fixtures rust, and wood rots. Because you can't always simply open a window, your bathroom should have a ventilating fan that expels moisture, odors, and household cleaners. It's important to find a fan that is up to the job. Luckily, our remodelers can help! How does it rate? The Home Ventilating Institute recommends that your exhaust fan be able to expel and replace the entire volume of air in your bathroom eight times per hour. A fan's ability to move air is measured in cubic feet per minute. To determine the minimum rating for an exhaust fan, calculate the bathroom's volume in cubic feet and multiply this by eight. When shopping for a ventilation fan, also consider how loud it is. Bathroom fans are noise-rated based on what we in the industry call a sone. The lower the sone rating, the quieter the fan will be. Optional features: Beyond their various CFM and sone ratings, bathroom exhaust fans come with a combination of other features. The simplest units have an exhaust fan only. Some of today's more popular models include a built-in light or heater. Top-of-the-line models may come equipped with humidity or motion sensors that turn the fan on and off when humidity reaches a certain level or when someone enters the room. Most bathroom fans have only one speed, although multi-speed models are available. It's best to talk over these concerns with our remodeling pros before beginning a project. The current trend in lighting in Tuscaloosa and surrounding areas like Birmingham is toward larger, sunnier baths, and today's top bathroom and shower designers are placing more emphasis on artificial light as well. A single, small lighting fixture protruding from the middle of the ceiling won't do anymore. Alternative sources of general lighting include recessed ceiling fixtures or indirect lighting that bounces off the ceiling or walls. In addition to good general lighting, you'll probably want task lights for all mirrors, separate compartments, the tub and the shower. Surface mounted fixtures: Install bulbs that emit 1 watt of incandescent or 1/3 to 1/2 watt of fluorescent light per square foot. Recessed fixtures: Install bulbs that emit 2 to 4 watts of incandescent light or 1/2 watt of fluorescent light per square foot.